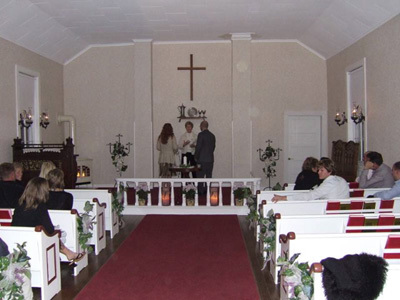 Thank you for choosing our church for your wedding or other occasion. Please leave the church in the same condition as when you found it. Use discretion in putting up decorations and do not use scotch tape or strong tape that will peel any of the paint off. If you would like to use the kerosene lanterns, please check with a church trustee. Use discretion with the possible movement of any furniture or fixtures. You may use the candles in the holders or furnish your own if you wish but please be careful with candle wax, especially in the area of the antique organ. Please do not use rice or confetti. Bird seed is acceptable, if thrown some distance from the church building. When the weather is cool, a staff member will take care of the heat at your request. 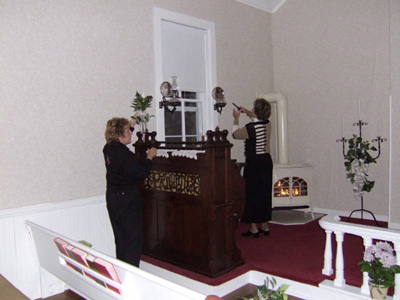 Upon leaving the building, be sure all the candles are extinguished, windows closed and the door locked. Your gift of $250.00 for use of the building is required not less than 2 weeks prior to the event. Please provide your payment to Paul Schumacher, 5530 Butts Road, Sturgeon Bay, WI 54235 with a check made out to Jacksonport United Methodist Church. We hope you have an enjoyable day.